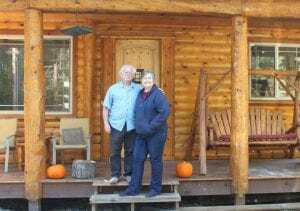 Allen Lesser and Adriane St. Clare stand on the front steps of the log cabin they had built in Morton. Photo credit: Joyce Fink. When most people relocate to a new city, they look for things like cost of living, availability of housing, types of recreation, and educational opportunities to help them decide if they want to move. For Adriane St. Clare, it was a matter of drawing two lines – one drawn west from Yakima and the other extending south from Buckley. The two lines met in Morton. “I have a sister in Yakima and my grandkids and a daughter live in Buckley,” Adriane said. 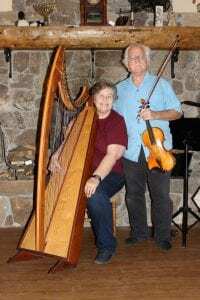 Allen and Adriane make a great duet on the harp and the violin. Music is what brought them together. Photo credit: Joyce Fink. She lived in Humboldt, California at the time and tried to visit them once a month, but that got too hard. “I didn’t want to miss the last part of their growing up,” she said. Reluctantly, he came up during the Labor Day weekend, looked around and decided everything fit. There was no violin teacher, there was no piano tuner and the Fire Mountain Arts Council always needs musicians. The first step in fitting the puzzle was finding a place to stay. They found some property just off Highway 508 but title complications kept them from buying it for nearly a year. 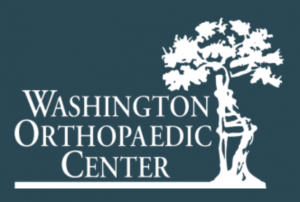 Finally they broke ground in April of 2016 and put in a foundation and some framework. Adriane found a log home blueprint and a contractor modified the plans to Washington code. 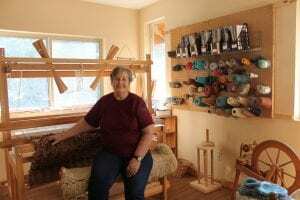 Adriane has a room set aside for her fiber arts. She made many of the rugs in her new house. Photo credit: Joyce Fink. “They told me we couldn’t have an open fireplace,” Adriane said. “You can in Morton,” she told them. Big cities need a fireplace insert or new construction for open fireplaces, but thanks to Morton’s reliance on wood heat, Adriane and Allen have an eye-catching, floor-to-ceiling, rock fireplace in their home. While their house was under construction, Adriane and Allen lived in a tent and then in a small workshop. “We had to get up in the middle of the night and go to the outhouse,” Adriane said. “It was all the way to the front door by the road,” Allen added. They ended up staying in the workshop for a year through one of the coldest, snowiest winters in recent memory. “We were very glad to get in here,” Adriane said of their move into the big house in August of 2017. Allen has played the violin since he was 10 years old and is now a violin teacher in Morton and at Yenney’s music store in Centralia. After studying for eight years as a youth under the concertmaster of the Los Angeles Philharmonic, he is now the concertmaster of the Pacific Northwest Chamber Orchestra at Centralia College. Although she was a psychotherapist for 40 years in California, Adriane has also had musical training on the side. She is a singer with the Olympia Peace Choir, plays the piano and has played the harp since 2016. Adriane’s version is slightly different: “We started to have fun the first lesson.” (She laughs.) “Then we started giggling and poking each other with bows.” End of lessons, they got married, but the fun hasn’t stopped yet. And Adriane never did learn to play the violin. Since arriving in Morton, the couple has been involved in many productions of the Fire Mountain Arts Council. This summer, it was Shakespeare’s Tempest turned into a musical; the vaudeville Sherlock Holmes and other Tom Foolery and the FMAC donor dinner. Allen has also played for the Nutcracker and donated his musicianship for the hospital auction. “There’s tons of stuff all the time,” Allen says. They also play at the Methodist Church, the Heritage House and at weddings. Allen agreed. “We just fit into this nice area,” he said. And how long will they stay? Adriane answered, “Until the end of our lives.” Morton is happy to have them.